Former mayor John Street (left) endorses mayoral candidate Sen. Anthony Hardy Williams at Venango House on Thursday. Philly’s earned-media mayoral marathon got underway in earnest Thursday. The latest campaign finance reports this week showed Mayor Jim Kenney with $655,692 in the bank as he seeks a second term, while his two primary challengers had far less — State Sen. Anthony Hardy Williams with $49,078 and City Controller Alan Butkovitz with $50,972. Those reports echoed as loudly as a starter’s pistol. So Williams and Butkovitz were courting reporters Thursday, using press coverage to press their message. We use the singular — message — because they shared nearly identical talking points about Kenney and diversity. 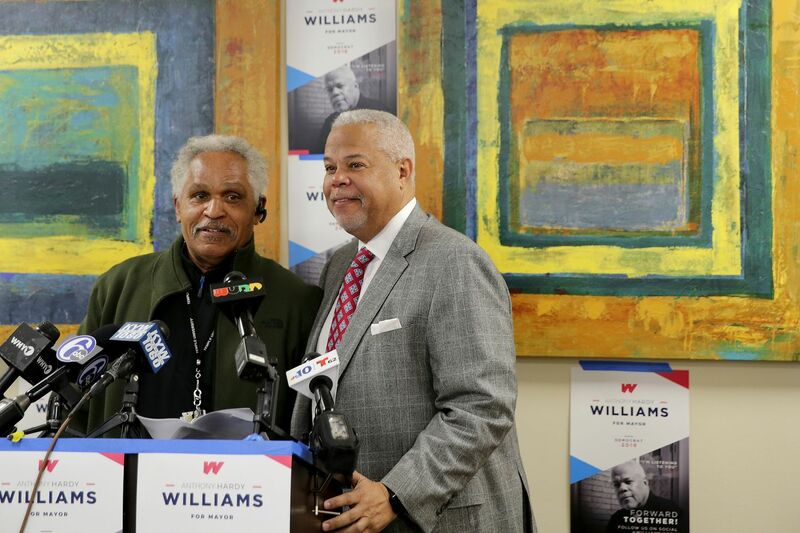 Williams received an assist from former Mayor John F. Street, who endorsed him and laced into Kenney for remarks he made last week to the African-American Chamber of Commerce, that he has trouble recruiting blacks to top posts in his administration because they are overqualified and take their skills to the private sector for bigger paychecks. Street seemed especially upset that PRWT, a local facilities maintenance firm with strong political ties that prospered during his two terms, is losing a city contract under Kenney. “There needs to be a commitment in a city that is now a majority-minority city to make sure that your contracting is fair and to make sure your administration looks like the people of this city,” Street said. Williams, who has called on Kenney to apologize for the comments, said it was “shocking” that other elected officials in the city have not raised a hue and cry. Butkovitz, standing in front of City Hall, also called out Kenney on the comments and the PRWT contract. City Controller Rebecca Rhynhart last week released a study on diversity in Kenney’s administration and other city agencies, finding whites were overrepresented in jobs compared to the city’s population. Thera Martin, director of communications for Sheriff Jewell Williams' reelection campaign, speaks at a news conference at the Society for Helping Church in North Philadelphia on Thursday. Sheriff Jewell Williams, still stung by the decision by his fellow Democratic ward leaders last week to not back him for a third term, had supporters defending him at an event organized by his campaign on Thursday. Thera Martin, his new campaign spokesperson, called a meeting in a North Philly church of women who say they don’t believe three allegations of sexual harassment made against Williams. Two cases were settled; one is pending in federal court. Martin wondered why City Councilman Bobby Henon, who was indicted Jan. 30 with John “Johnny Doc” Dougherty and six other officials from Local 98 of the International Brotherhood of Electrical Workers, doesn’t face the very public outcry Williams has seen. Martin, who did not mention Henon or Dougherty by name, said it was interesting Henon can “still go to work every day unencumbered, no protesters to meet him at the door.” She also noted that Dougherty “is welcomed into the arms of the Democratic City Committee,” sitting on the board that considers and recommends endorsements. That board last week initially recommended an endorsement for Williams and then revoked it. Former U.S. Rep. Bob Brady, chairman of the local party, said Martin should not have attacked Dougherty and Henon. The Philadelphia AFL-CIO has endorsed Williams, something that could not have happened if Dougherty wanted to block it, Brady noted. "She’s wrong in saying that,' Brady said. Dougherty, via spokesperson Frank Keel, shrugged it off with a joke. “John wasn’t aware that he’s been drafted to run for sheriff, but he’s flattered nonetheless,” Keel emailed. Billy Ciancaglini, a Republican running for mayor in Philadelphia, has been waging a flame war on Facebook, targeting a South Philly restaurant for its charity work. Billy Ciancaglini, the lone Republican running for mayor in Philadelphia this year, has an unconventional approach to economic development. He has been in a running Facebook flame war for two weeks now with Le Virtù, a South Philly restaurant that gained some attention for helping a family that, facing a deportation order, has taken refuge in a city church. Ciancaglini, a Democrat-turned-Republican who became a vocal online supporter of President Donald Trump, kicked things off by vowing to never eat at Le Virtù again. He later admitted he had never eaten at the restaurant before, either. Ciancaglini demanded to know if the restaurant’s owners, Francis Cratil-Cretarola and Catherine Lee, had done charity work for other causes. They have. Still unsatisfied, Ciancaglini unleashed some vitriol and encouraged his fans to do the same. Cratil-Cretarola said his restaurant has endured “waves of orchestrated stupidity,” including harassing phone calls, fake reviews posted online, phony reservations, and calls for immigration officials to conduct a raid. Ciancaglini, a defense attorney, now says he was just asking questions and “didn’t intend to attack this business.” Still, he decries anyone helping people who are in this country illegally. “That’s aiding and abetting,” he said. Facebook trash talk is cheap and so — apparently — are Ciancaglini’s fans. His latest campaign finance report, filed Tuesday, shows just $2,068 in the bank.